If you have access to a secure structure that is already built and safe to inhabit … Great. That is not always going to be the case. 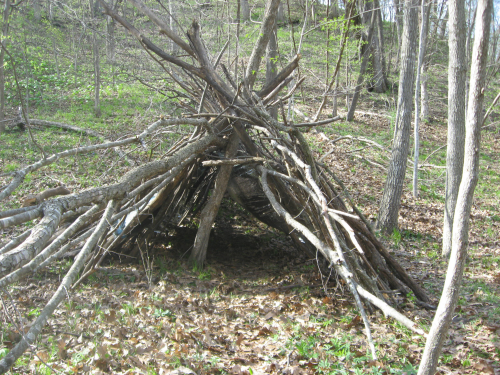 I have had to use what I learned in shelter building twice so far. Once when I got caught in a blizzard and once while mushroom hunting with my children. You just never know when this knowledge could save the lives of you and/or your family. 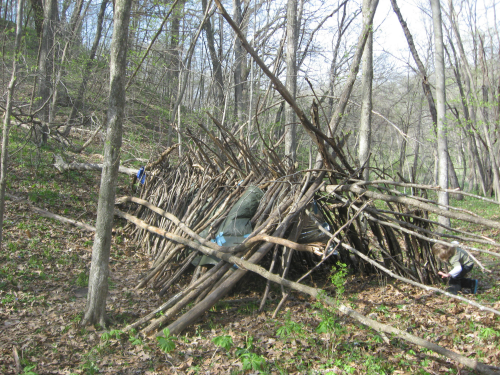 Knowing how to build a survival shelter is a vital skill for if SHTF! To teach my children and grandchildren, we made it into a hiking adventure game. We fill our packs and hike in to an area we deem suitable. The area would need to be close enough to all the materials nature so graciously provided, an area of level ground, and it also had to be an area we could secure (Animals… maybe even people). 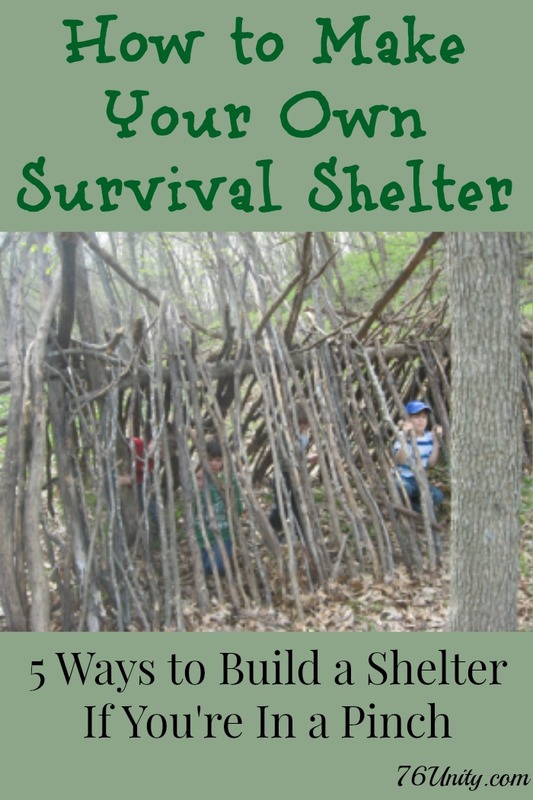 When determining your type of shelter, you should ask yourself the following questions. 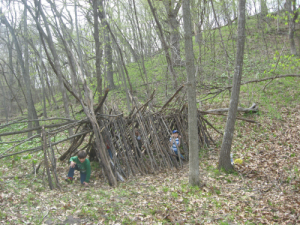 How much time and effort you need to build the shelter? Risk vs. Reward philosophy. Will it adequately protect you from the elements (sun, wind, rain, and snow)? Do you have the tools to build it? If not, can you quickly make the tools needed? 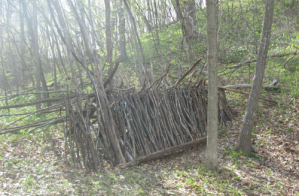 Can you safely forage for the type and amount of materials needed to build it? Note: When at rest, you lose as much as 80 percent of your body heat to the ground, so please keep this in mind. Emergency Blankets are lightweight, compact, and affordable – invest in several per person. Basic structure is often provided by two standing trees for the side posts. You can also use two branches as your side poles. Now you just need a branch to attach horizontally for the top. Use the earth as your building base at the rear and begin stacking branches, from the ground up, to rest on your top roof branch. Fill in as tightly as possible. You be the judge on how elaborate to want to be, dependent upon your energy level and ability to recharge your system. Most choose to make it just large enough to fit in it and basic coverage on the top. You can also fill in the sides so you have coverage on all side except the front opening. Keep in mind, working with what mother-nature provides (such as; Hillsides, stones, fallen trees…whatever is available) means that you save precious energy. This is one of my favorites and I am always amazed at how nature often provides at least a portion on the labor for me. A partially constructed tent structure is a huge time and labor saving gift. Here is are a few photos of the last one I constructed with my four young grandsons and my daughter. Note: We used only deadfall. No trees were cut down for our shelter. I used a large downed tree as our main center pole and the angle of the hillside. Since the tree was solid against another tree, all we really had to do was cover the sides and a bit of fill next to the hillside. 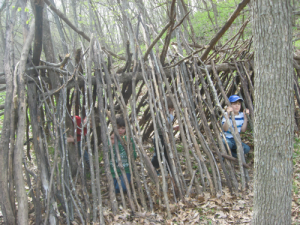 We could have used leaves and/or bark to fully cover the sides but my grandsons wanted to see some options for using their emergency blankets instead. This debris hut (tent) was built to shelter my family of 9 so it is obviously larger than most would need to be. In my opinion, this is the most labor and materials intensive of all the shelters, however, it certainly has its benefits. To get up off the ground by creating a platform can save you some serious body heat and help to keep you dry. (Can also create a sense of comfort from critters too.) 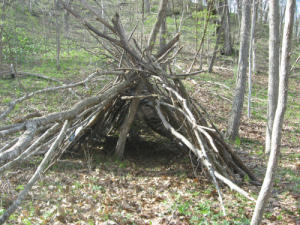 Just as nature can provide you with the beginnings of your shelter, it can also create the basics of your platform. If you have to start from scratch, you will need 4 sturdy branches for the corner posts. 4 more to attach to complete the sides. Once you have these solidly constructed, you can lay down the base (lay branches in the same direction- as evenly as possible, remember you will be laying on this surface). Dig in one branch in the front and one in the back to attach your horizontal center pole. Now your framework is finished. Time to create the side walls. I prefer to use my base of the platform to rest my side (roof) branches on. I begin filling from the back to the front, filling a bit from each side as to keep the pressure as even as possible from side to side. This helps to minimize the risk of tipping untied branches on your platform base. Obviously, you can lash all your platform branches together like a mat, but this uses up valuable time, energy, and resources. You can fill in any spaces between the branches with grasses, leaves, bark, or even mud. 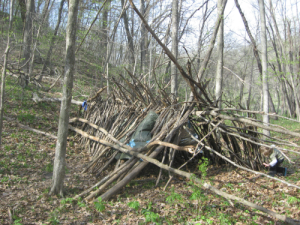 This shelter is best if you have material to drape around and can weigh down the edges. For this shelter you will need on strong branch or standing tree for the center. If you do not have any material to use as a drape, you can use the following method. I prefer to trace a circle on the ground around the center pole to help keep my outer ring uniform. Gather and begin laying branches at an angle resting against the center pole. You can sink the bottoms into the earth at the base to help hold them secure and lash the top of the branches to your center pole in a weaving fashion. I usually have several people that I need to provide shelter for so I have a tendency to make my lodging a bit larger. I pick out 6 branches and attach them around my center pole, then use smaller ones for fill. Having two people is very handy for this but not required. Start by finding 3 branches about the same size. Lay them down and weave the smallest ends together with cordage. When you stand them up, you can spread them out like a tripod. Your base is ready and the filling in process can begin. Use deadfall whenever possible- nature reverent and reserves your energy too. Digging in some of your fill branches can provide some added security and stability for the shelter.